You are here:HomeBlog[FAR Partnerships | ACYOA Dispatches]: Khachkars. [FAR Partnerships | ACYOA Dispatches]: Khachkars. Our week in Gyumri is behind us. We’ve since visited the Haghpat and Sanahin monasteries in Lori Marz. We continued onto the town of Dilijan, where ASPers toured Goshavank monastery. From there, we visited the village of Noraduz and Lake Sevan. Noraduz is a cemetery that was in use between the 7th and 17th centuries. Currently, it houses largest collection of Khachkars in a single location. Khachkars are a distinctly Armenian art form. From a single slab of rock, craftsman carved out a rectangle. They’d adorn it with a cross, surrounded by intricate patterns. Many of them tell stories. 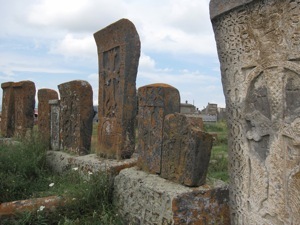 Khachkars were commissioned to commemorate events like a birth, or death. Today, Armenians adorn their tombstones with pictures of the dead; a trend that emerged during the Soviet period. 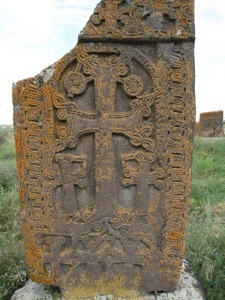 Traditionally, however, Armenians who could afford it, placed Khachkars on top of their graves. It took at least 4-5 months to carve one. During our visit, we weaved in and out of the stones, now overgrown with tall grass and weeds. We stopped to examine the patterns etched into each one. Apparently, no two Khachkars are alike.